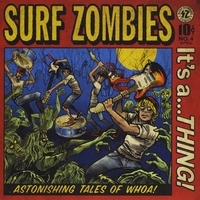 Hello from The Surf Zombies. We have been gaining momentum since launching in 2006. With new bass man Trevor Treiber from The Blendours adding his hard hitting melodic punk rock bass slamming and high level song writing skills, the songs and shows continue to get more interesting and intense. It's very rare to find a band able to actually collaborate as friends and the music and shows are all the better for it. Each album has been a joy to work on with extreme challenges and problems to solve. We are trying to pick up the pace and get more music out faster. It is a lot of fun to come up with the weirdest titles for songs we can possibly dream up. The whole thing is about fun. Guitars,amps, reverb, fuzz, Jaguars Jazzmasters, Danelectros, wammy bars, beer, traveling, bars, fans, friends, merch, working together. We are very thankful for your interest in the band and hope to see you at a show. BIG THANKS!